(CNSNews.com) - The U.S. Treasury quietly warned at the end of a statement issued last Wednesday that it expects the federal government to hit its legal debt limit before the end of this year--which means before the new Congress is seated--and that "extraordinary measures" will be needed before then to keep the government fully funded into the early part of 2013. On Aug. 2, 2011, President Obama signed a deal he had negotiated with congressional leaders to increase the debt limit of the federal government by $2.4 trillion. But, now, after only 15 months, almost all of that additional borrowing authority has been exhausted. One of the first things you can expect from the newly re-elected President Barack Hussein Obama is to initiate more reckless debt-borrowing by Congress to give to the criminals on Wall Street. It wouldn't have mattered if Obama or Romney had been elected, just as I've been saying for the longest. Congressman Ron Paul said this week on The Alex Jones' Show that there's “little difference between Obama and Romney.” I couldn't agree more. There's not a dime's difference between the two politicians. You've got two separate legs of Democrat and Republican both walking in the same direction of a New World Order. Don't fall for Obama's alleged tears of sincerity before and after re-election. Remember that Hollywood actors get paid to cry professionally on camera anytime required. All you have to do is think about a loved one or pet dying and it's easy to cry. Tears are NOT a sign of sincerity. A true sign of sincerity is when a person tells the truth, even on pain of suffering personal loss, criticism or rejection by others. You know that a person is sincere when they do what they do freely, and not for money. Mr. Obama has proven again and again how INSINCERE he is, by lying, conniving and deceiving the American people. 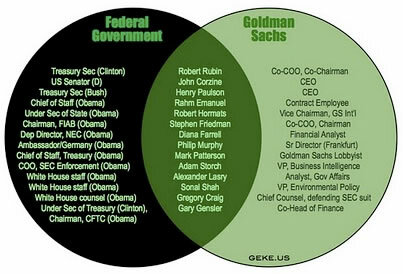 After promising in 2008 that he would not cater to private interests (lobbyists) if elected, Obama has appointed at least 37 former Goldman Sachs employees to government positions. Our nation's debt has exponentially increased during Obama's presidency, stealing all the money they can at a back-breaking pace. They're all a bunch of criminals and thieves! I learned recently that U.S. Presidential candidate, Ted Cruz's wife is a vice president at Goldman Sachs. Ladies and gentleman, these people running America today are thug criminals, homosexuals and Satanists!!! The newly re-elected President Obama said in his first speech, “You know I tell the truth.” In fact, we know that Obama does NOT tell the truth. President Obama lies, and lies and lies, continually to the American people and Congress. Sadly, Congress is largely corrupt and cannot be trusted to do the right thing anymore. Only 40 of the 535 members of Congress voted against NDAA. Most members of Congress are either bought-off, scared or just don't care anymore, just going along to get along. Americans have picked their poison. It wouldn't have mattered who won the election, the New World Order will continue. I am against both Barack Obama and Mitt Romney. I am neither Republican nor Democrat. As a Christian I believe that the answer is in America's pulpits, through the preaching of the gospel and the Word of God. The answer has never been in The White House nor politics. The stealing will continue. President Obama's presidency has been defined and plagued by Wall Street stealing more than anything else. No matter what happens over the next four years, one thing that I assure you will continue is the massive theft and plundering of U.S. citizens by the international banking cartel. What's Going On? Why Are U.S. Cities Going Broke? We are being ravished by the banking cartel. Our national sovereignty is being destroyed. Obama promised more jobs upon being re-elected, particularly jobs for returning veterans. We'll see about that. Nationwide, cities are broke and are resorting to desperate measures just to pay their police and fire fighters. Indianapolis, Indiana is placing KFC ads on fire-hydrants to raise revenues. Scranton, Pennsylvania is paying firefighters and police minimum wage. They're broke! I heard a woman on the news blame the economic slump on the high price of oil and health insurance. What a joke! Long before the banksters usurped control over America's money supply, our founding fathers fully grasped the dangers of a central bank and warned us. President Woodrow Wilson was a hundred times worse than Benedict Arnold, catering to the financiers and being a key figure responsible for the passing of the Federal Reserve Act in 1913. Once passed into law, the international banking cartel started World War I to get their new money-machine into motion. Here's a historical chart of U.S. public debt. Notice that wars always drastically cause massive public debt. Debt to who? The bankers, who else? Debt forces people to have to borrow money. There's a science behind economics and money. If the bankers lend (have the U.S. Treasury print out of thin air) more money, then there is more of it, so the value of the dollar decreases. It's basic supply and demand. Gold is very expensive because there's only so much of it. I heard recently in a chemistry documentary on PBS that if you collected all the gold in the world, it would occupy a 26 foot cube. The Federal Reserve operates as a domino effect. The more money the banks print (lend), the less it is worth, so inflation rises and people are forced to borrow more money, so the banks print (lend) more and the vicious cycle continues until the banks own everything and Americans are totally bankrupt. That's exactly what's happening. The system can only thrive on the premise of borrowing money. This is why the banking cartel starts so many wars and crisis like The Great Depression of the 1930's. Notice on this chart again that borrowing skyrocketed during The Great Depression. The banks got rich while Americans were losing their farms and homes and jumping out windows to commit suicide. That's how the globalists take over nations. They create economic hardships on nations through civil war, inflation of imports (such as oil) and various other evil means. Then the nation is forced to borrow from the World Bank. On average, there are over a hundred stipulations that must be met. So basically the country has to sell their soul to the globalists to receive the loan. That's how they take over. The U.S. is a prime example. Through inflation (rising prices), deflation (printing more money lowers the value of money), the banks force Americans (whether individuals, business or governments) to borrow money from the banks. And so it still is today over two centuries later! The criminal banking scam isn't new my friend. As the dollar devalues, inflation increases, and jobs continue to leave the country (deindustrialization), people are broke. So cities are forced to borrow money from the banks (Wall Street). It is neither federal, nor do they have any gold reserve. The Federal Reserve is a mere title for a privately owned corporation owned by various banking families. 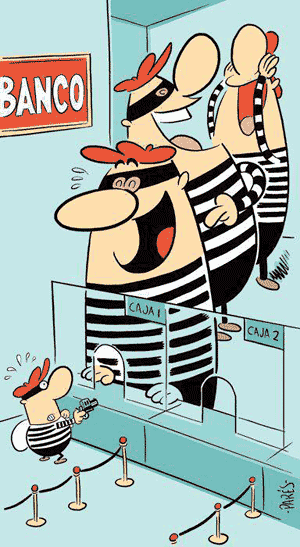 Corruption is the key to successful organized crime. The main difference between the banks and the Mafia is that the banks effectively have a license to act the way they do. Banks rip-off innocent people for trillions-of-dollars and at no real penalty. Any private citizen would get jail for a long time. It's like giving $100 parking fines to mass-murderers as punishment. The banks steal trillions and are fined millions. Only irrefutable evidence can get an actual indictment in court, and that takes several years. The courts cater to the banksters. They're in everyone's pocket. Paying The Ultimate Price For Standing Against Wall Street's Blatant Crimes? It was the banking cartel who had Kennedy assassinated. G. Edward Griffin exposes these evil criminals. The Wall Street crime-culture is the big problem in America. They're the reason why you have to pay for three homes just to purchase one. They're the reason why you lost your home to foreclosure. They're the reason why a loaf of bread has risen to ridiculous prices. They're the evil behind the evil. Wall Street pays peanuts for their crimes. Wall Street has been caught and exposed for their crimes, but they're above the law. They control the mainstream newsmedia and the large newspapers nationwide. Who can stop them? The Wall Street Industrial Complex controls the Pentagon. The Wall Street Industrial Complex is the criminal relationship between Wall Street, Washington D.C. and the Pentagon. The network of crime is massive. Anyone who bucks the system risks persecution, threats, false imprisonment, even death of self and/or loved ones. In the New World Order, you either go along or are considered an enemy. Ultimately, the coming Antichrist will demand allegiance (worship of the image) or people will be killed (Revelation 13:15). Those elite evil people think they're getting away with their wickedness, but there is a God in Heaven Who KNOWS everything that men think and do. Proverbs 24:12, “If thou sayest, Behold, we knew it not; doth not he that pondereth the heart consider it? and he that keepeth thy soul, doth not he know it? and shall not he render to every man according to his works?” Jesus said in Matthew 12:36 that men shall give account, even for their idle words on judgment day. How much more shall the bankers give account for stealing trillions-of-dollars from hard-working, innocent and unsuspecting people, forcing them into poverty, hardships and even suicide? Woe unto Wall Street and the hidden destructive globalist powers behind the subversion of America.